Java and SimpleITK are a natural fit. 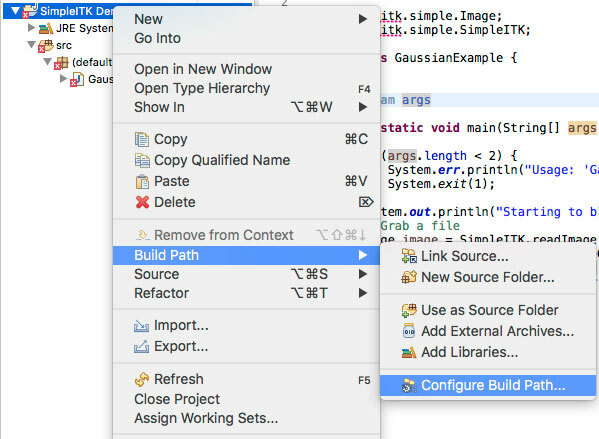 Like the bindings of other languages wrapped by SimpleITK, SimpleITK’s Java bindings have a language-specific component (traditional Jar file), and a native component (native shared library). This combination requires a little more setup, but is largely transparent to the developer. For any other OS, you must build the binaries yourself. Download Eclipse on your platform of choice. Eclipse is a commonly used integrated development environemnt (IDE) used for Java because it makes development, debugging and deployment streamlined. Then, create a new project in Eclipse. Choose File –> New –> Project…, choosing Java Project in the Eclipse project wizard dialog, and name the project as you like. In this example, our project is called SimpleITK Demo. Create a new class by choosing File –> New –> Class, or simply copy the code below and paste into the project item in the Package Explorer view and Eclipse will automatically create the class and hierarchy for you. If Eclipse is working as expected, you should see errors on lines 16-20. These errors occurs because we have not told Eclipse where to find SimpleITK’s jar file. 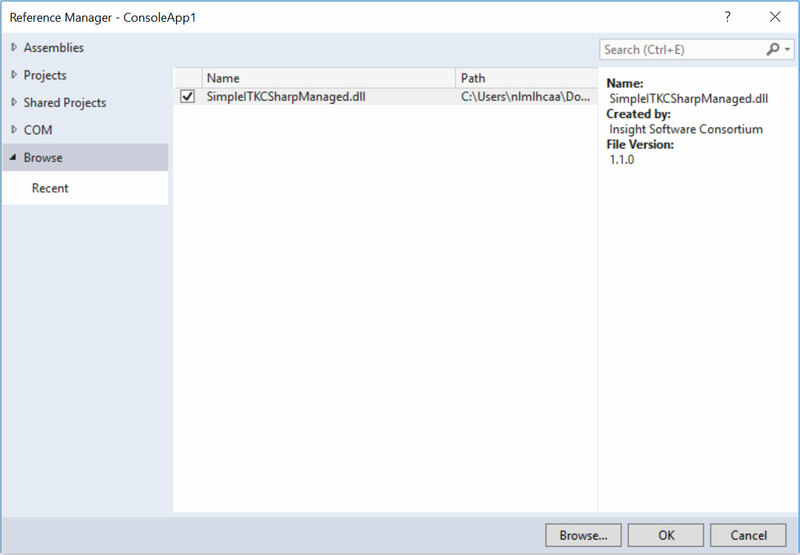 In the Properties dialog, click on Java Build Path and Add External JARs… then navigate to the SimpleITK jar file. When selected, click the down arrow to expose the options for the jar. The three options of interest are: Source attachment, Javdoc location and Native library location. The Source attachment specifies where the source code for the SimpleITK jar file resides. In our case, it is distributed as simpleitk-source.x.x.x.jar where x.x.x is the version number of SimpleITK. The source attachment is useful for debugging the SimpleITK library, if necessary, because it allows the debugger to step through classes provided in the SimpleITK jar file. This setting is optional. The Javadoc location is also optional, but extremely helpful in developing with Java. Having Javadoc available provides Eclipse with in-line documentation for each function, if provided. We highly recommend supplying the Javadoc location to Eclipse. Set the Native library location to the directory containing the platform specific JNI library, i.e. libSimpleITKJava.jnilib on Mac OSX, libSimpleITKJava.so on Linux and SimpleITKJava.dll on Windows. After providing the library location, our example code runs correctly. When running this example from the command line, the native library location needs to be specified to the JVM, e.g. -Djava.library.path=/path/to/SimpleITKRuntime. The SimpleITK Java bindings closely follow the C++ conventions, i.e. each class contains the public member functions. However, the functional interface is handled differently in Java. In particular, every static Java function must belong to a class, unlike C++. In SimpleITK, the functional interface is contained in a class called org.itk.simple.SimpleITK. This class contains the functional interfaces as static member functions, i.e. org.itk.simple.SimpleITK.readImage as shown in GaussianExample. The naming conventions for all SimpleITK classes follows the C++ conventions, but member functions and the function interface follow the Java conventions of using CamelCase with the first letter lowercase. In Java, the C++ function itk::simple::ReadImage becomes org.itk.simple.SimpleITK.readImage. This guide will show how to set up a C# project in Microsoft Visual Studio 2017 using SimpleITK binaries. The same steps should apply for all other versions of Visual Studio. Download Visual Studio if you don’t have it. 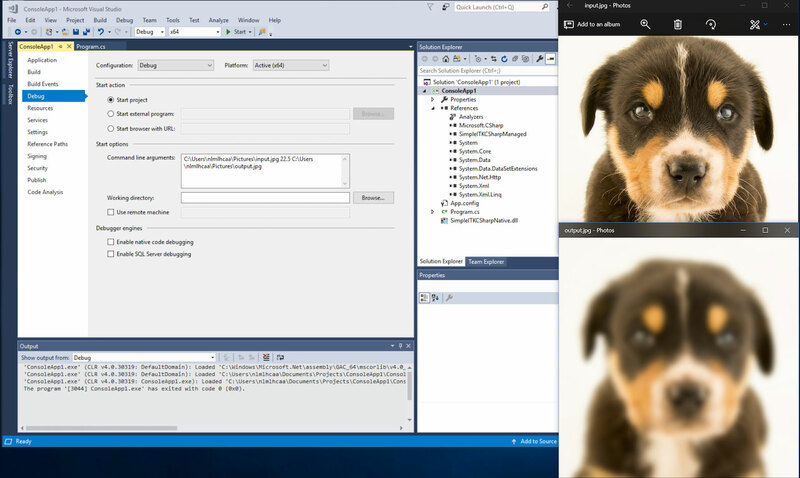 Then, create a new project in Visual Studio. 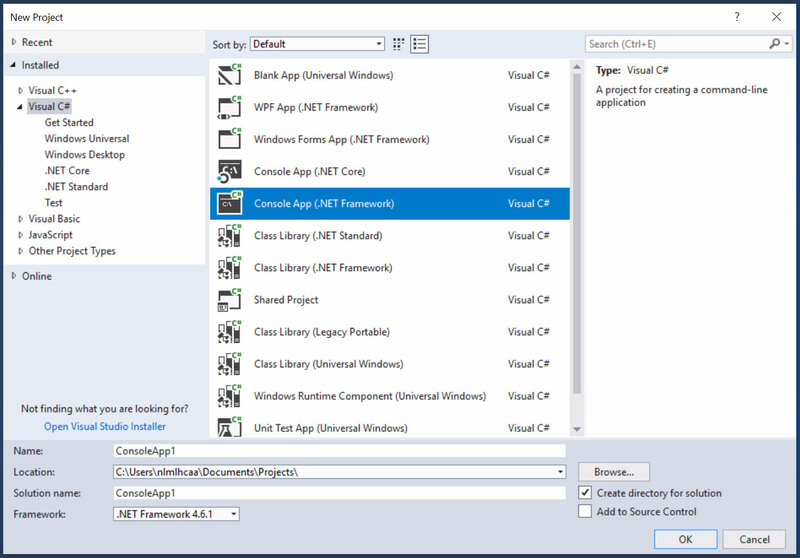 Choose File –> New –> Project…, then select “Visual C#” and “Console App”. The SimpleITK binary only supports a single architecture platform. Your project should be configured to match that same platform. By default, in the Toolbar “Debug” is selected for the Solution Configuration and “Any CPU” is selected for the Solution Platform, this needs to be changed. The architecture of the SimpleITK binary needs to be added, and the “Any CPU” architecture needs to be removed. This needs to be done for both the “Active solution platforms” and the “Platform”. From the menu bar select PROJECT->Add Reference… to bring up the Reference Manager. 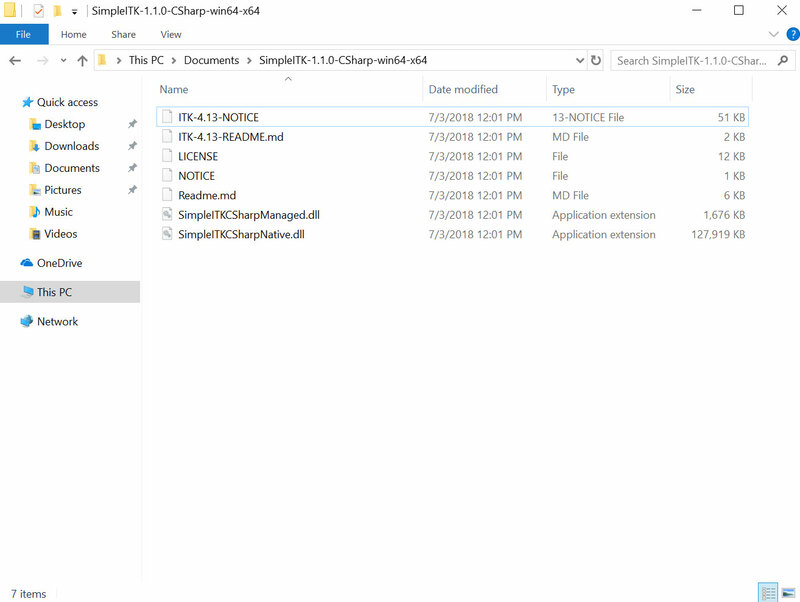 Click Browse… and navigate the file system to unzip “SimpleITKCSharpManaged.dll” from the binary download, then click OK to add. From the menu bar select PROJECT->Add Existing Item… Select “Executable Files” for the extension type. Then navigate the file system to the unzipped “SimpleITKCSharpNative.dll” file from the binary download. IMPORTANT in the “Add” button’s pull down menu select “Add As Link”. 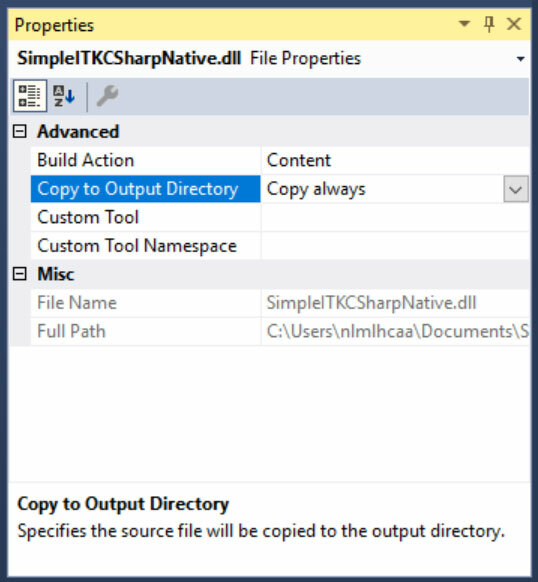 In the Solution Explorer right click on the “SimpleITKCSharpNative.dll”, and select “Properties”. Then for “Build Action”, choose “Content”, and “Copy to OutputDirectory” choose “Copy always”. Now that we have configured the project, let up copy a basic SimpleITK example to compile and run. The SimpleGaussian in C# is a simple one to test our configuration. This can just be copied and pasted into the code editor. 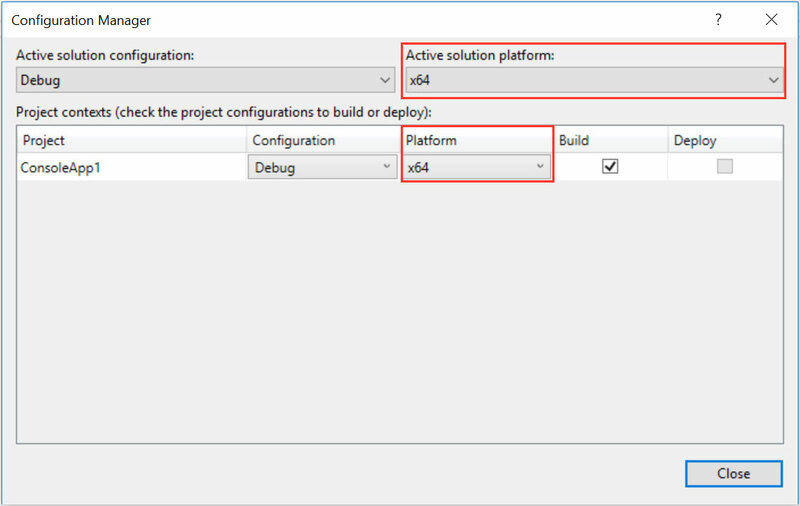 Then click Build -> Build Solution. Assuming you have followed all of the steps thus far, you should have an executable you can run from the command line or from Visual Studio by adding command line arguments in Project -> ConsoleApp1 Properties… -> Debug.